Win Cool Prizes! Enter the Inbox.com Christmas Contest! 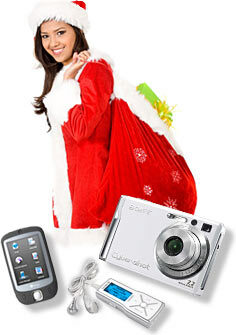 December 1, 2007: Would you like to win a HTC Touch, Sony Cyber-shot Digital Camera, SanDisk Sansa m240 1GB MP3 Player or free 30GB upgrade of your account capacity? Then you should definitely participate in our Inbox.com Christmas Contest! The Inbox.com Christmas Contest is open to both current Inbox.com users and new users who setup an account at Inbox.com during the month of December 2007. Read more to find out how you can win! access your Inbox.com Email anywhere you go with this cool mobile device. take hiqh quality photos and store them in your online Photo Album at Inbox.com. listen to your favorite music and radio anywhere you go! enjoy extended storage capacity for your emails, photos, videos, documents and other data. Double Your Chances of Winning! Both current users and new users have 10 prizes that can be won - so you have double the chances to win! Once you setup a new account, you can start inviting your friends and family to join Inbox.com, the top 10 that have the most respondents who join will win one of the valuable prizes. Invite your friends to join Inbox.com and get rewarded. The top 10 users whose invitation to join Inbox.com is accepted by the most people will be rewarded with valuable prizes. You can send an invitation by clicking on the "Send an invitation to a friend" link in the left menu of your Inbox.com Email, or using our Refer a Friend form. Always make sure that you have entered your Inbox.com email address, it will be used to identify the users who join Inbox.com per your invitation. Enter your personal comment to motivate your friends to sign up. Setup an account at Inbox.com and win! Any new users who join Inbox.com from December 1st through 31st, 2007 will automatically get a chance to win a valuable prize. And that's not all! Once you setup an account, you can increase your chances to win by entering the contest as a current user. Spread the word, invite your friends to join Inbox.com and win! Please note: Only active users are eligible to win, so once you setup your account, make sure you log into it at least twice a week, and send or receive at least two emails. The winners will be announced shortly after the expiration of the Inbox.com Christmas Contest by email and in the Inbox.com News section. All items will be distributed in January and account upgrades will also be done in January. Any participant of the Inbox.com Christmas Contest must read and agree to the the Inbox.com Christmas Competition Terms & Conditions before entering the contest. By setting up an account at Inbox.com or sending an invitation to a friend to join Inbox.com, you acknowledge that you are agreeing to these terms. Everyone who sets up an account at Inbox.com, or sends an invitation to a friend to join Inbox.com between Dec. 1 and Dec. 31, 2007 is automatically entered, aged 18 years or over (the "Users"). It is not open to employees, contractors or consultants, of Inbox.com, or its affiliated companies. Such prohibition against participation in the competition shall extend to family members of such employees, contractors or consultants. No purchase is necessary. Inbox.com Christmas Contest will start on 12/1/2007 and end on 12/31/2007. Inbox.com Christmas Contest includes two separate rounds - round #1 for current Inbox.com users who invite other people to join Inbox.com, and round #2 for any person who sets up an account at Inbox.com within the period mentioned above. Round #1: Active users who acquire the most new Inbox.com users by sending them an invitation to join Inbox.com will receive prizes mentioned in the table below. Round #2: Every person who sets up an account at Inbox.com and will be using this account actively within the period mentioned above will enter a lottery whose winner will receive prizes mentioned in the table below. For purposes of this contest, an active user, or active use means that the user logs into his/her account at least twice a week and sends/or receives at least 2 emails. Winners will be announced by email shortly after the expiration of the Inbox.com Christmas Contest. At all times in association with the Inbox.com Christmas Contest, it is hereby acknowledged that Inbox.com shall have the right to use such Users' names for promotional activities that receive some item of value as a result of these terms. Inbox.com Christmas Contest rules can change at any time. Such changes, if any, will be posted at http://www.inbox.com. Additionally, Inbox.com reserves the right to cancel the Inbox.com Christmas Contest at any time or for any reason in Inbox.com's sole and absolute discretion. If any claims are brought pursuant to these terms and conditions or pursuant to the Inbox.com Christmas Contest in general, such claims may only be brought within the jurisdiction of Palm Beach County, Florida. User hereby irrevocably submits to such jurisdiction regarding the subject matter hereof. The laws of the State of Florida shall apply and be used in interpreting these Terms and Conditions, the Inbox.com Christmas Contest, or any and all claims brought pursuant thereto. These Terms and Conditions represent the entire understanding between the User and Inbox.com. HTC Touch is a registered trademark of HTC Tech Computer Corp. HTC Tech Computer Corp does not endorse or sponsor any Inbox.com promotional activities. Sony Cyber-shot is a registered mark of Sony Corporation. Sony Corporation does not endorse or sponsor any Inbox.com promotional activities. SanDisk is a registered trademark of SanDisk Corporation. SanDisk Corporation does not endorse or sponsor any Inbox.com promotional activities.